Arrival time: 6:30 - 7:00pm. Free pick-up in Dist 1 as mentioned meeting point. Transport: Tourist bus, motor & row boats, bicycle. Cai Be with small floating market & An Binh island. 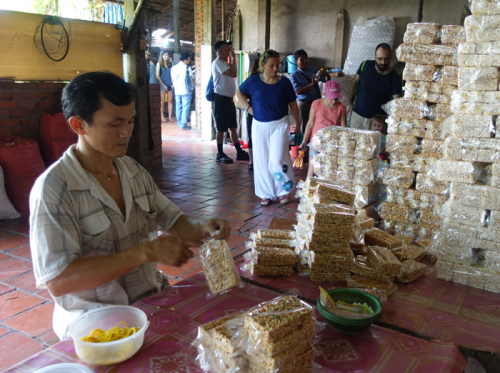 Crispy rice cake and coconut candy factories & hand-made items by coconut trees. 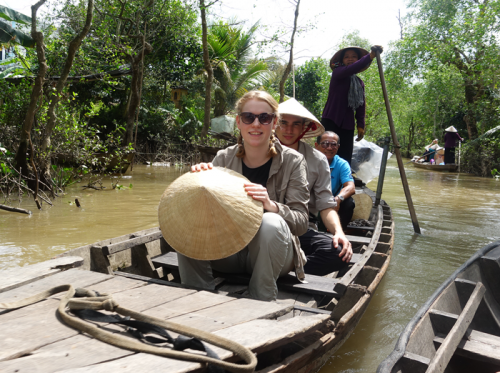 To meet your demand in relaxing and exploring, Viet Fun Travel is offering One day Mekong Delta Tour from Ho Chi Minh City. 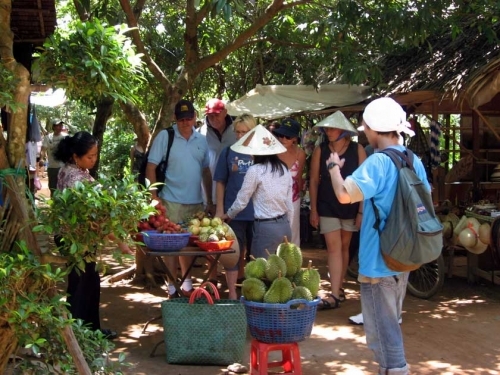 Mekong Delta Tour is a popular tour with many attractive destinations such as Cai Be floating market and An Binh island with fresh fruits. 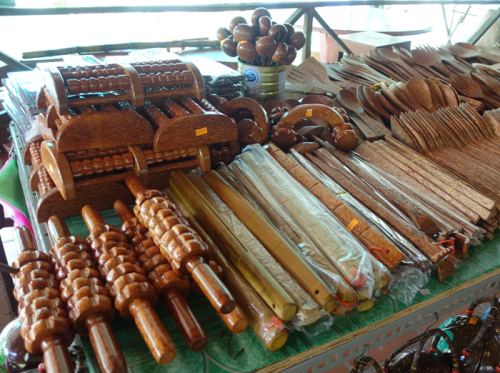 You can visit coconut candy, crispy rice cake factories and buy local specialities for souvenir. It’s certainly ideal trip on your holiday. 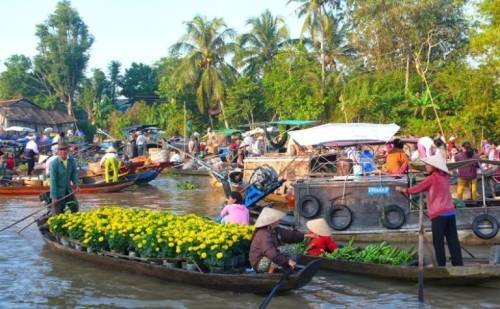 You will have chance to visit floating market in Mekong river. This tour is the most suitable for any clients with a short trip in Vietnam. 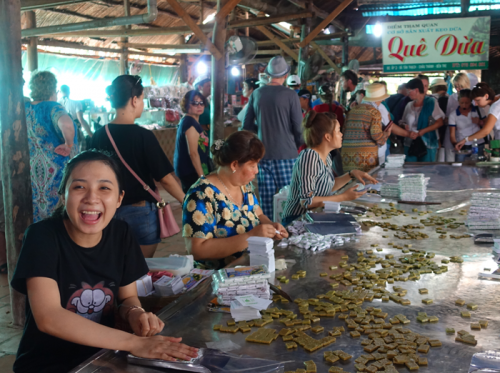 With One day floating market tour, you can find out the life of the local people there. What will they use transport in Mekong Delta? 07.30am: this morning we will start to visit one day Mekong Delta tour (Cai Be - Vinh Long) around 3 hrs driving. On our dedicated bus/car you can see the green paddy fields stretching towards the horizontal. After the rest, we are divided into many small groups and get on small row boats. During this 20 minutes trip, your boat will zigzag through a maze of shadow canals to enjoy the fresh air along the canal and wonderful water coconut tree landscape. After that, we will ride bicycles (if weather and time permits - optional) and roaming through a village about 20 minutes to visit our natural view with quiet and peaceful villages or we can relax on a hammock for a short rest in Mekong Delta. The next stop is Vinh Long City from An Binh Island (35 minutes by boat), we will land on a marketplace and walk around to have a good opportunity for seeing how and what the poor rural people of Vietnam sell in Vinh Long City. You are encouraged to interact with the merchants and see how loving and respectful they are. It takes about ½ hr here to find a lot of interesting things for little amount of money. Standard Type: Air con tourist bus, English speaking tour guide, boat trips in Mekong delta have enough lifejacket for everyone, entrance fees, normal lunch and 01 Aquafina water bottle/pax. Deluxe Type: Air con tourist bus, English speaking tour guide, boat trips in Mekong delta have enough lifejacket for everyone, entrance fees, good lunch and 01 Aquafina water bottle/pax. High quality car or van, English speaking tour guide, boat trips in Mekong Delta, 1 lunch with local speciality - Elephant eared fish, coconut water, entrance fees and 01 Aquafina water bottle/pax/tour. Mentioned addresses exclusion, please come to Viet Fun Travel Office (28/13 Bui Vien St, Pham Ngu Lao Ward, District 1, HCMC) at 07.15am - 07.30am.